We all wish to have hair and beard like movie stars and models. Surprisingly, hair and beard of some animals are as beautiful as human’s. Here the list of 10 most beautiful beards in animal kingdom. Lynx is a medium-sized, beautiful member of the cat family. 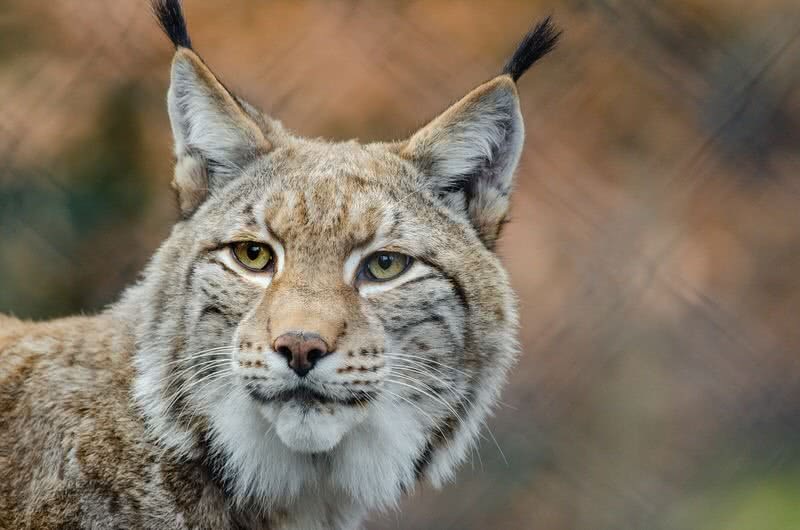 There are four species of lynx in the world – Eurasian, Canadian, Iberian, and Bobcat. The found in the forested areas of North America, Europe, and Asia. All four species have an impressive thick coat and gorgeous facial hair. Besides the stunning appearance, this thick fur makes lynxes well adapted to live in the cold environment. Color of their coat varies with the seasons – brown in summer and gray in winter. This color change of fur is to balance the body heat. The beard and characteristic black hair on the ears of Lynxes are as beautiful as their body fur. Bactrian camel is renowned for its two humps where Arabian camels have only one. This endangered species is found in rocky deserts of Mongolia and China. As you can imagine, the stored fat in these two humps helps Bactrian camels to survive without water for a long period. The adaptability and beauty of Bactrian camels not just by their humps. They have thick fur and beautiful, long beard which measure up to 9.4 inches in length. Thickness of their fur change according to the season. In summer, they have a thin fur. In winter the fur becomes thicker. 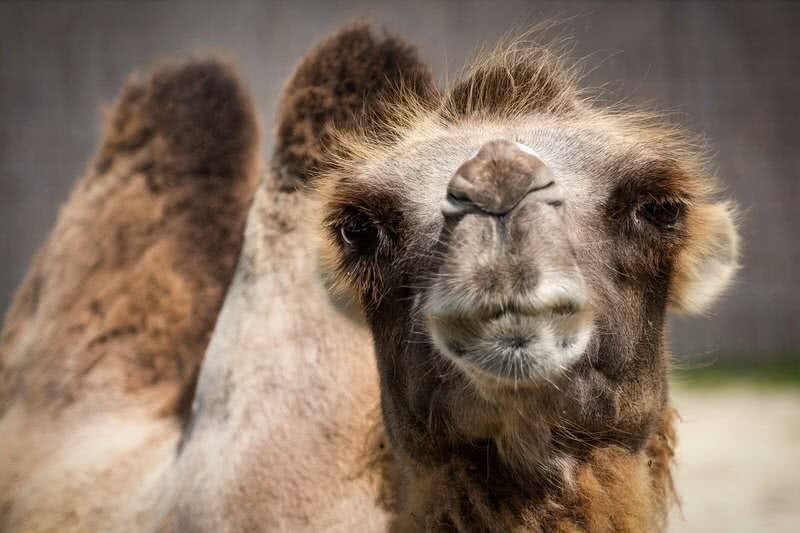 It helps the Bactrian camels to keep their body cool regardless of the season. 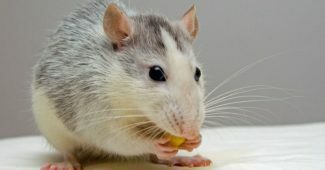 Their dense eyelashes and nostrils which can be shut down at the time of desert storms also play a significant role in surviving in the harsh desert environment. Markhor is a beautiful but endangered species of goat found in high altitude mountains of West and Central Asia. 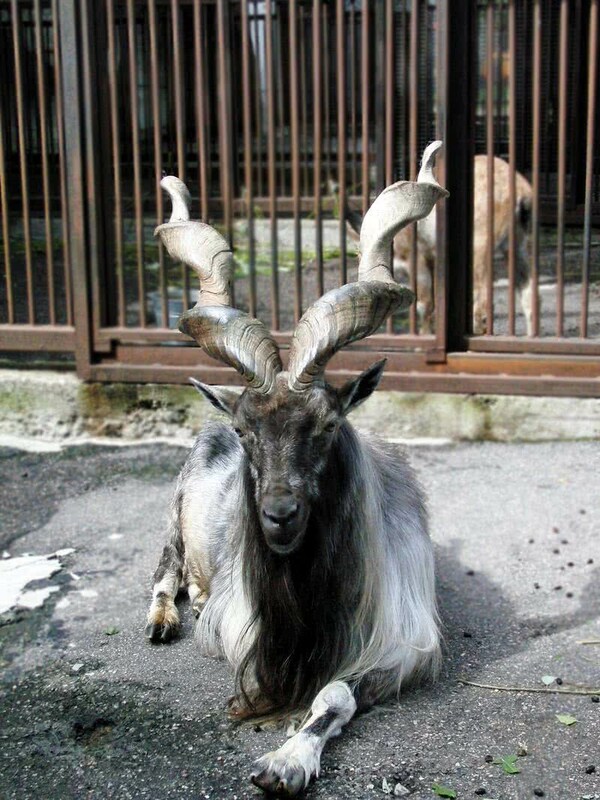 The beauty of this unique species is characterized by its long hair on twisting horns and long coat. Male markhors have an attractive black beard. Females also have a beard but shorter one. Both the color and length of the coat changes with the season. In summer, Markhors have a short, reddish coat. In winter, they have long, gray coat. The most noticeable feature of a Markhor – the striking twisting horns can be reached at a length of 1.6 meters. Compared to males, the horns of females are much shorter. The beard of a bearded dragon is not like any other beard found in the animal kingdom. In fact. It’s not a beard at all. When threatened, this striking species of lizard flare the through the region. Then, the spines on the throat and sides of the head become enlarged. At this time, it seems like they have a gorgeous beard. That’s why they named so. The amazing bearded dragons are live in subtropical woodlands and shrublands of Central Australia. Apart from their spectacular beard, this reptile has a long tail (up to 22 inches), which almost has the same length of its body. 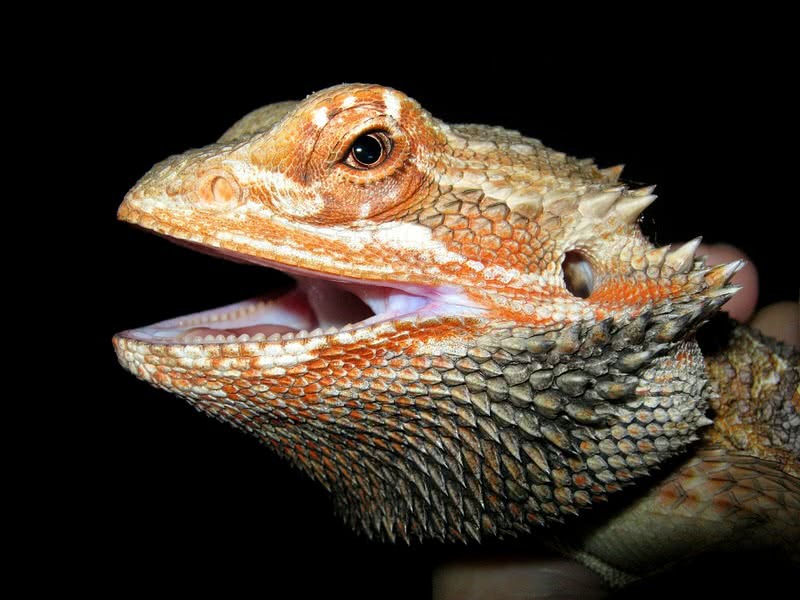 In color, bearded dragons are yellowish. But to maintain the body temperature, they change color from dark (cold temperature) to light (hot temperature). Inca tern is a stunningly beautiful bird that breeds on the high cliffs and islands of Peru, Ecuador, and Chile. 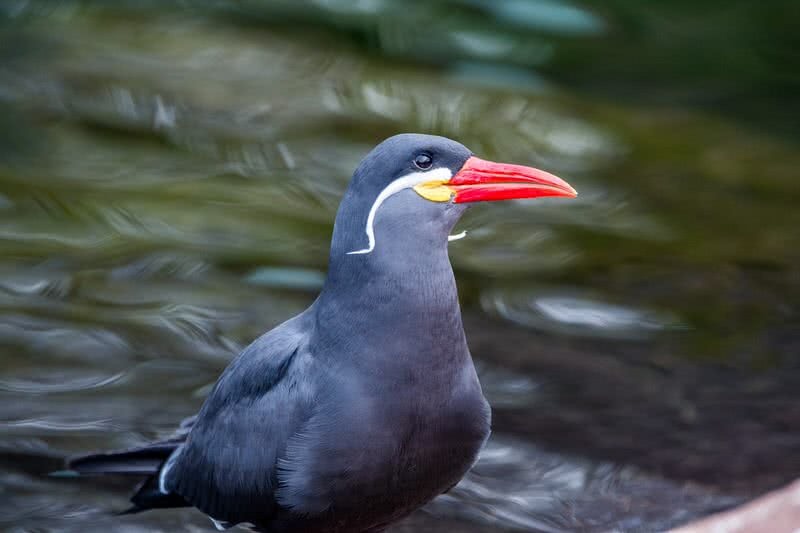 The most eye catching feature of Inca terns are their long white mustache. This impressive mustache can be found on both male and female bird. The gray plumage of Inca Tern is as impressive as its mustache. This colorful bird also has bright red bill and legs. There are two species of orangutans in this world – Sumatran and Bornean. Sadly, both are critically endangered due to habitat loss. Both orangutans have orange to red colored fur. 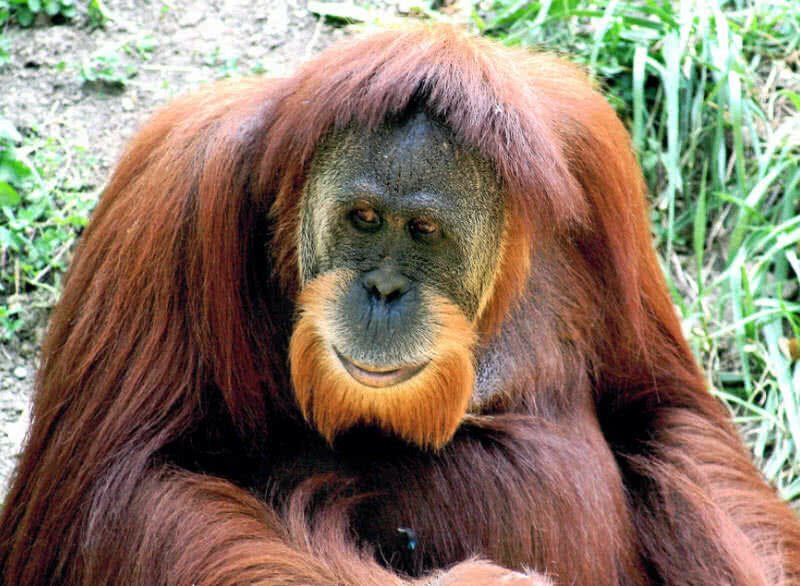 But compared to Bornean orangutan the Sumatran have a long beard. This beautiful beard can be found in both male and female orangutan. The fully grown beard appeared at the age of 15 when they become mature. As the name indicates, the beautifully bearded Sumatran orangutans are native to Indonesian Island of Sumatra. This amazing mammal has an impressive size. When fully grown, a male orangutan weighs 60 to 90 kg and female weighs up to 50 kg. 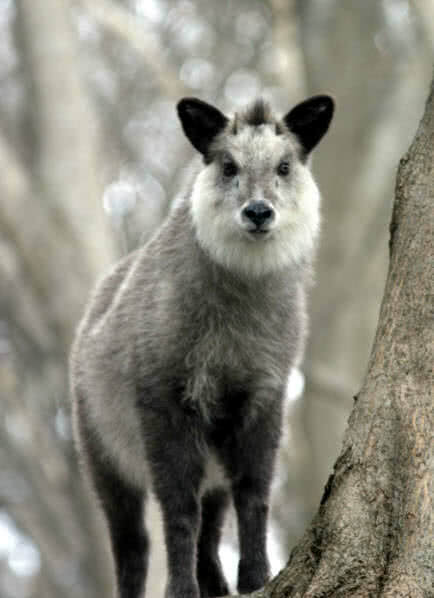 An extraordinary goat-antelope that found only in thick forests of Honshu Island of Japan. A matured Japanese snow weighs 30 – 45 kg and stands at the height of 32 inches. At a glance, what you are going to like about this mammal is nothing, but it’s beard. With thick, white fur around the chin and neck, it’s one of the most beautiful beards in the animal kingdom. Their coat is long and black to whitish in color. At the first look itself, you would understand why this dog named as ‘Bearded collie. Yes, it has a beautiful beard. Probably better than any other dog breeds. First of all, the bearded collie is an exceptional shaggy dog. The long beautiful hair can be seen all over their body including from chin and throat. It gives them one of the coolest beard ever seen in animals. 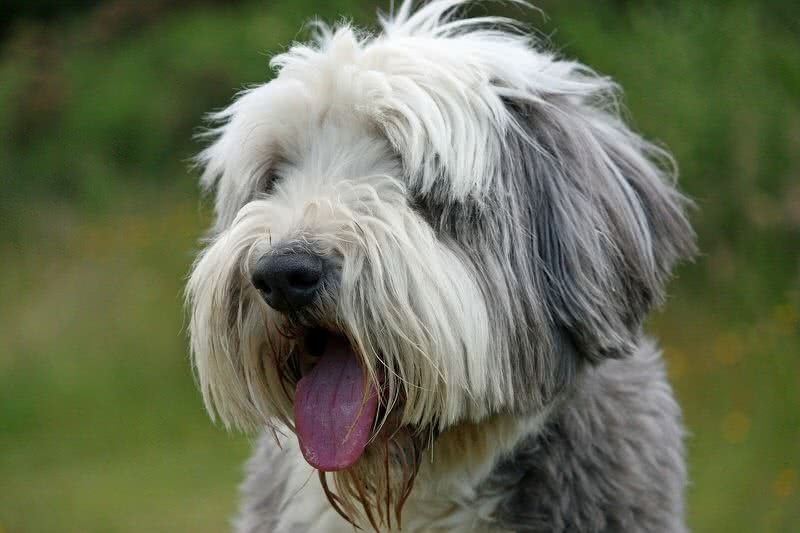 The long hair of bearded collie comes in blue, black, brown and light brown with gorgeous white markings. Bearded collies can not just be a show dog but also a great family companion. Bearded emperor tamarin is one of two species of emperor tamarins in the world. The second one is black chinned emperor tamarin. Both species have an excellent long, white mustache. But the black chinned emperor tamarin lacks the impressive beard found in bearded emperor tamarin. That’s which after the bearded emperor tamarin named so. Lives in the rainforests of Brazil and Peru, bearded emperor tamarins have a small body. A fully grown tamarin does not weigh more than 900 gram. Their coat has a gray color with yellow markings on chest. 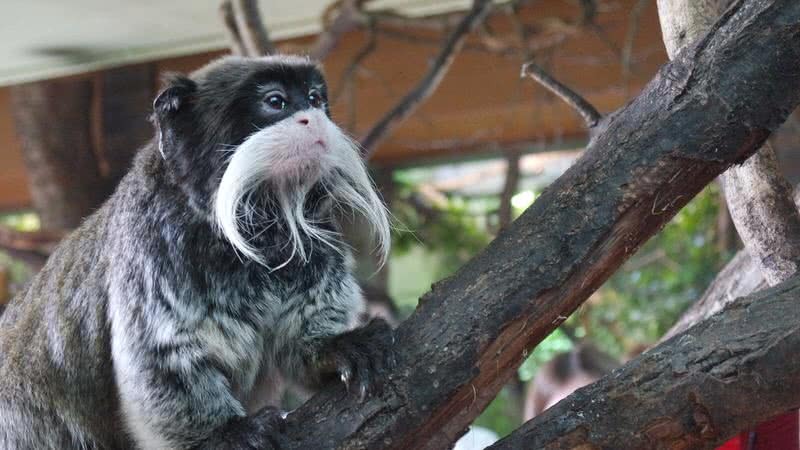 This dark coloration of coat pays a vital role in highlighting the impressive beard of tamarins. Why is a lion regarded as the king of the jungle? Because they are fearless, powerful and a symbol of strength. 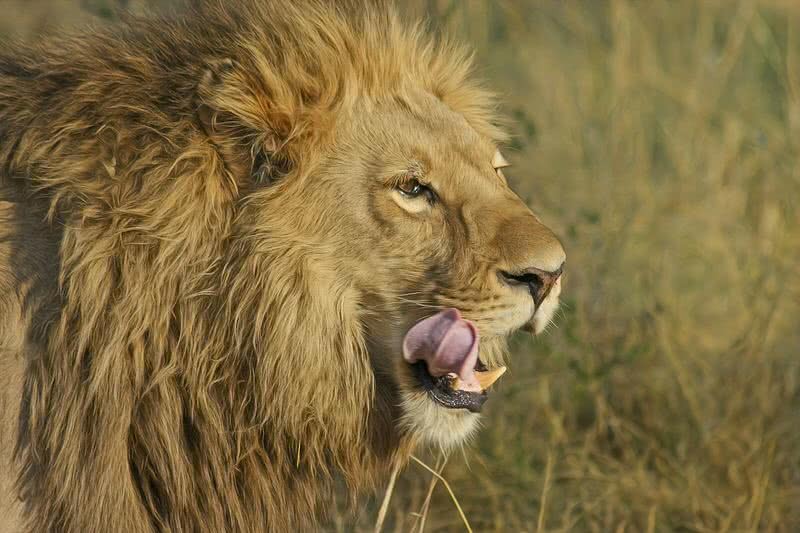 Like a crown of the king, the male lion has a thick mane. In fact, it’s the most distinctive feature of a lion. The mane of lion king is so unique among cat family. Grows in both length and thickness, it’s also the most beautiful beard found the animal kingdom. This exceptional beard can be found in different size and colors. Commonly found colors are reddish brown or black. The color and size of their beard depend on age, climate, hormone, and genetics.